As a patient ambassador, Donald Wilkins provides updates, information and general reassurance for all the patients and families involved in the perioperative process. 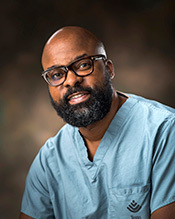 Wilkins exceeds his job requirements by assisting the surgeons with family communication. He assists the admissions staff when they need clarification regarding patient classification and he identifies families that need a little extra time and attention. On one occasion, Wilkins identified a family that traveled from Louisiana and did not have resources for hotel or food. The family was too embarrassed to ask for help but with Wilkin’s intervention the family was able to get some assistance. Another family confided in Wilkins that a particular person in the waiting area had been asking other people in the waiting room for money. Wilkins confronted this person who immediately ran out of the waiting area. Wilkins called security and was able to snap a photo with his cell phone. Security was able to assist and the person was caught. If Wilkins had not been alert and or had not been able to develop a dialog with other family members this may had not come to light.